Romney must know better than anyone that the folks running our big banks ... are hardly paragons of risk assessment. After all, Bain Capital, where Romney made his fortune, existed in part because worthy businesses often could not borrow on attractive terms from traditional banks. He must know two other things about these banks: They are too big to fail, and too complicated to regulate. So where is he when economists say that the better alternative is not more of the failed policies of the Obama years—regulating the unregulatable, bailing out when all else fails —but breaking up the big banks? Not for vulgar populist reasons, but to improve the functioning of the capital markets. If so inclined, he could toss in a fairness argument to top off the economic efficiency point. Democrats seem to have a monopoly on wanting to save consumers from the big businesses with which they often partner. Why does Romney not agree with the Consumer Financial Protection Bureau (CFPB) that mortgages should be made more understandable to the borrower? After all, good conservatives should favor programs to eliminate “information asymmetry”—a situation in which one party, in this case the lender, knows a lot more about the costs and risks inherent in a transaction than does the other party. Ritual denunciation of the CFPB's actual proposed regulation follows, but far more striking is Stelzer's affirmation that the government should indeed require mortgage companies to be more transparent. Stelzer is not an outlier. There's a lot of thinking on the right these days that the banks need to be brought under control. The very conservative Dallas Fed called for breaking up the big banks this past spring. The Arkansas financier Warren A. Stephens said the same thing on the Wall Street Journal's very conservative op-ed page around the same time. So did James Pethokoukos of the almost pathologically conservative American Enterprise Institute, also in the Weekly Standard. And so did Arnold Kling of the libertarian Cato Institute in National Review. All these conservatives have turned up, on this issue, in bed with a gaggle of thinkers on the left: Katrina vanden Heuvel, Robert Reich, Sherrod Brown, Bernie Sanders ... I could go on. I’m not looking to break apart financial institutions. I think what caused the last collapse was a convergence, almost akin to a perfect storm, of many elements in our economy and regulatory structure. … And if we have in place modern regulation and regulators who are keeping their eye on the ball, there’s no reason to think we will go into another crisis of the kind we just endured as a result of the mortgage meltdown. This was the rare campaign statement that could just as easily have come out of the mouth of President Obama, whose position is that Dodd-Frank solved the too-big-to-fail problem. If Romney really wanted to deflect Obama's Bain attacks, a good way to do it would be to position himself to Obama's left (along with Stelzer, the Dallas Fed, Stephens, Pethokoukos and Kling) by calling for limits on how big banks can become. It would mesh well with the "crony capitalism" theme Romney's been struggling to develop, given Obama's ties to J.P. Morgan's Jamie Dimon and the Democratic party's diminished-but-still-significant coziness with Wall Street. And it would allow Romney to demonstrate that he is willing, occasionally, to say things that the finance industry doesn't want to hear. He would seem less of a pinstriped Wall Street apparatchik. 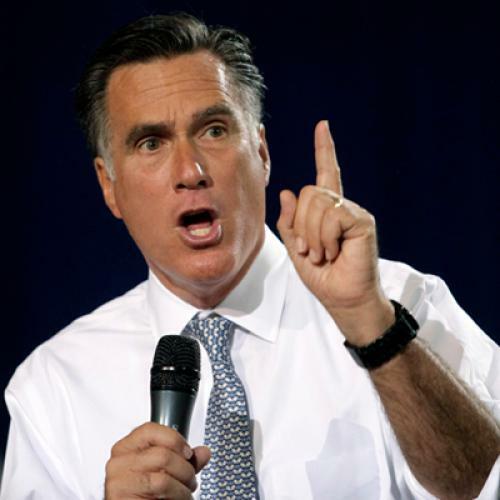 The problem, of course, is that Romney really is a pinstriped Wall Street apparatchik. So even if he says he's for breaking up the big banks, I wouldn't hold my breath till he did it as president. Romney is such a Wall Street apparatchik, in fact, that I feel safe in predicting that he would never, ever, call for a breakup of the big banks. Ever. He'd renounce Mormonism before he did that. Not going to happen.